Give your car's engine a clean bill of health with NEUTO Therapy - the world's first intelligent hydrogen dry cleaning system. NEUTO™ Dry Hydrogen Auto Therapy™ is the world first Hydrogen Dry Cleaning System that can effectively DIAGNOSE, PRESCRIBE, MONITOR and CLEAN the car engine with pure and dry Hydrogen Gas stored in the Solid State Metal Hydride Canister. It is exclusively invented for vehicles running on Internal Combustion Engines. NEUTO™ THERAPY™ removes stubborn micro molecular carbon layers at hard to reach places like air manifolds, piston rings, valves, and spark plugs without causing any damage to the car engine wall and components in the engine. NEUTO™ Dry Hydrogen Auto Therapy™ can naturally cleanse the car engine in the most sustainable organic way. Hydrogen gas is stored in the Solid State Metal Hydride Canister. Metal hydride storage technology produces 100% dry and 99.9999% purity hydrogen gas. It has the highest hydrogen mass density at room temperature and much lower storage pressure compared to highly pressurize compressed gas tank and freezing temperature cryogenic hydrogen storage cylinder. Safety is never compromised. High purity of hydrogen gas also means that NEUTO™ THERAPY™ can effectively clean your car engine to breathe new life within 20 to 30 minutes of the process duration. No two cars are exactly alike even with the same make of brand and model. Every car has different technologies, engine capacities, traveling mileages and most dynamically every human driver is uniquely different with his/her own driving habits and behaviors. 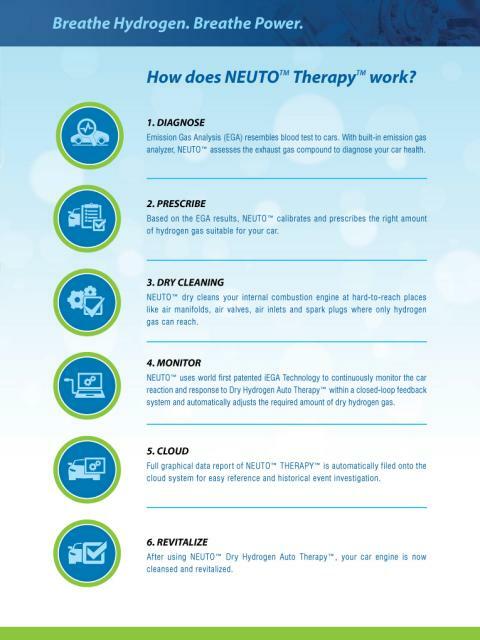 NEUTO™ THERAPY™ world first patented iEGA technology tailors every treatment for your car engine with precise control of dry hydrogen gas amount released at calibrated flow rate and optimal process duration. When the carbon deposits are effectively removed, car engine performance is restored and revived to its former glory. Symptoms of bad carbon buildups such as rough cold start, unpleasant engine noises and vibrations during idling or premature detonation conditions will improve significantly. You can expect maximum drivability performance in torque power and fuel efficiency improvement by 10-20% statistically. Due to varied engine technology used, capacity, mileage traveled and the unique characteristic of the driver habits and behaviors, no two cars is the same. Our first in the world patented iEGA technology customized treatment tailored to your car at the right hydrogen flow rate within an optimum duration defined. The Best Engine Doctor you could ever have Restore and Revive We care for you and your car. Visit NEUTO workshops and experience the Magic of Hydrogen today! Edited by Neutrinos, 12 February 2018 - 08:49 PM. Neuto uses pure hydrogen gas to dry clean your engine. Neuto helps your car breathes smoothly and revives the performance to improve horsepower, fuel efficiency and driving pleasure. Hydrogen is explosive, you know? Hydrogen Safety is our the number one concern. Without hydrogen safety, we don’t talk about innovation. 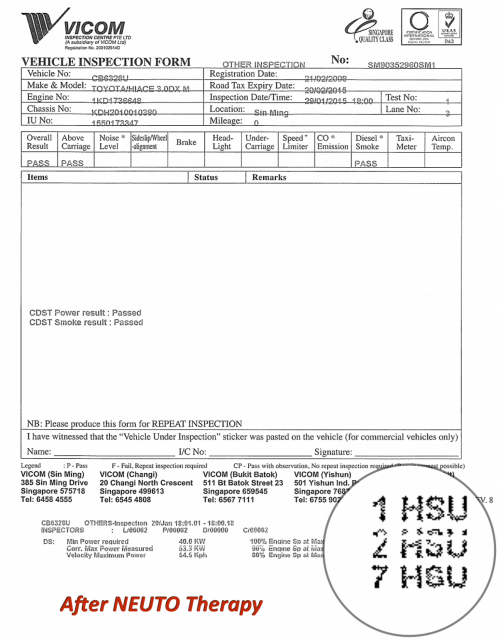 Hydrogen can be dangerous if it is stored in compressed Hydrogen tank or Liquified hydrogen gas tank. Those common hydrogen carrier are high pressure and unstable in room temperature. It requires professionals to handle it. That is why we choose Metal Hydride as the hydrogen carrier. Metal Hydride stores the hydrogen gas in solid form in room temperature. It is low pressure, highly stable, highly pure and safe for transport and operation. We also add sensors and safety features to ensure hydrogen safety, so that you can reap the maximum benefit of hydrogen without worry. old way of clear carbon is to rav high or use chemical. But rav high need to rav some time, like going NSHW then effective. Chemical itself is causing pollution to the environment. They use H2 at high temperature to react with the carbon deposits become HC (hydro carbon). Then burn it with O2.The end result is CO2 and H2O. Simple Chemistry theory but they managed to make it commercially possible. The part I don't understand is how their machine could "teach" our ECU to inject correct quantity of O2 and HC for complete combustion. My old pok car, after cleaning has zero CO and zero HC (un-consumed petrol). Edited by Galantspeedz, 08 January 2018 - 10:02 AM. Can this be used on hybrid cars? Yes, it can be used for Hybrid, but only for the combustion engine portion. Your mechanics has to ensure that the car doesn't switch to electric motor while doing Hydrogen cleaning. NEUTO Therapy revitalizes your car back to original designed condition. After NEUTO Therapy, your car will be more responsive, perform better fuel efficiency, higher torque and horsepower. Dynomometer test shows impressive horsepower and torque gain up to 20% after NEUTO Therapy. Cleaner engine prolongs the lifespan of your car and give you better driving experience, which includes smoother and lighter drive, more responsive and cold starting of your car early in the morning will never be the same again. On top of that, NEUTO is an eco-friendly product. Report shows that NEUTO Therapy reduces that hazardous gas such as Hydrocarbon, Carbon Monoxide and black smoke up to 70% to 90%. NEUTO improves the air quality we breathe. When you do NEUTO Therapy, you are contributing to the environment too! Edited by Neutrinos, 24 January 2018 - 06:01 PM. Nea inspection is coming up. Why i hear my friends say can do neuto therapy at the workshop first before inspection will be better than nothing to do? Will it be able to totally clean the dirty valves caused by direct injection? Any before and after picture? Edited by Kklee, 06 August 2018 - 10:41 PM.